Fitting must be done by a qualified or experienced person. Your panel can be mounted on any suitable, solid surface. Vertical, horizontal or angled mounting will not affect its operation. Sunlight will affect panel elements over time. 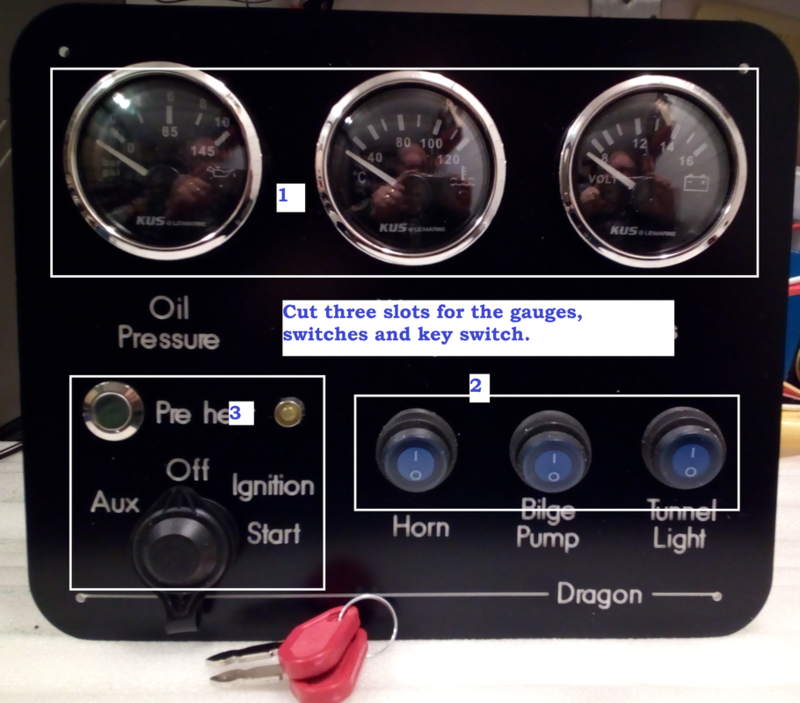 Retro range panels must be fitted into a cabin or wheelhouse. VDO panels are suitable for open cuddy, weather deck, covered flying bridge or open wheelhouse. KUS panels are suitable for fitting in exposed positions but not areas that will flood or be washed when the craft is exposed or underway. It will extend the life of your panel by many times if you simply covering it with a suitable UV resistant item when the craft is not in use. In a wheelhouse a simple cloth cover would be fine. Ensure that your panel is correctly supported when you fit it. DO NOT cut a single hole that the whole panel will fit into. Cut slots that will allow the gauges and / or switches to pass through the surface. See picture below. In this example, we would cut three slots to allow the gauges, switches and key switch assembly to pass through the surface. This mat require unplugging some of the connectors and re-sighting them from the rear. It is best to take photos of the wiring before you do this so that you know how to reconnect them. Ensure that there is room at the rear of the panel for all the gauges and wiring. Most panels will require a minimum of 100 mm of space some will require more. Fixing down. Your panel will have been supplied with 3mm fixing holes. You may counter sink these if required to 1.5mm depth. DO NOT over tighten your fixings or you will crack the panel. Should the number of fixing holes need to be increased take care to mark the point to be drilled with a sharp pointed object to prevent the drill slipping. Fix to a flat even surface. Your panel will flex slightly but should not be fitted to a curved or uneven surface. Water-resistance. The panel above is water resistant. It has KUS gauges which have a mechanical seal, The switches also have a mechanical seal. The seal the panel. If the panel needs to be sealed to its surface a gasket (mechanical seal) or sealant should be used. The panel will not react to grease, silicones or rubbers. DO NOT use glues of any type to seal your panel down. Ongoing care of your panel. Your panel has been designed for a long largely care free life. Panels mounted in a dry environment will only need wiping down with a damp soft cloth from time to time. If your panel becomes soiled normal household detergents will not affect it, only use them with a soft cloth. DO NOT USE ABRASIVE MATERIALS ON YOUR PANEL. Your panel will scratch do not use sharp tools or abrasive cloths or materials on your panel. Do not place or drop heavy or hard objects on your panel.